Every craft has its experts, but one thing we seldom remember is this: every expert started out as an amateur. They all have their secret bloopers and fails early in their career, and unless they are really down-to-earth, you don’t get to hear a lot about them. Never fear! 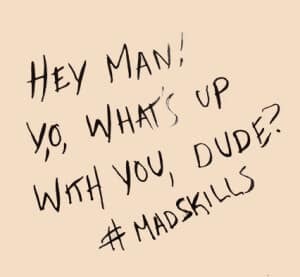 I figured instead of waiting until I became an expert and risk the memories of my blunders fading, I would share with you a couple of mistakes I’ve made and things I’ve learnt about calligraphy (so far) as an amateur! 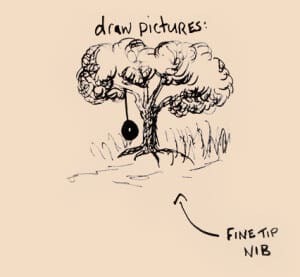 If you want to know what simple (and sometimes utterly stupid) things to avoid, and what tips will help you get a start in the art of pen and ink, this is for you. 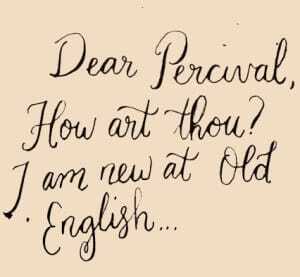 To begin with, I didn’t have a clue what nibs to use for my old-fashioned quill pen. In fact, the one I’ve been using I didn’t even know the name of before I Googled it (#fail). Along the road of my skim readings and perusals however, I found that the nib I was currently using was actually a good one to start with as a beginner. 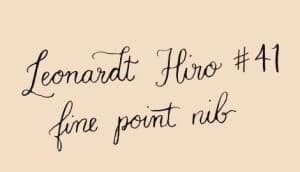 It was a cheap Leonardt Hiro #41, a fine point nib with a fair amount of flexibility. Translation: It mostly writes thin and small, but easily. every half a letter, and ink ran all over my paper. In desperation I grabbed the manual that had been buried in my drawer, and discovered a little thing called an “ink reservoir”. My trouble being that this particular nib came with a detachable ink holder that enabled the pen to keep up a steady stream of writing. 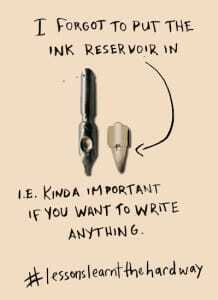 Without it, the nib couldn’t hold any ink. Queue a real ‘duh’ moment. Having found the ink reservoir and attaching it to the back of the nib and thus solving my stupid problem, I found the roundhand nib to work quite effectively. I liked the thicker style, though the ink can be a little messier than the finer Hiro #41. 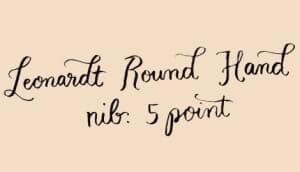 From what I’ve read and noticed, it seems these two nibs are perfect to begin calligraphy practise with. Granted, I don’t know a whole lot about technique yet, but there are a few things I have learnt from observing others, and from experimenting with my own pen and ink. A couple of tips I heard have been really helpful. 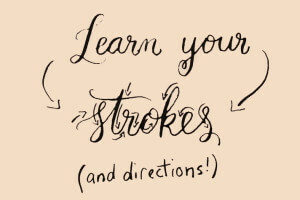 The first one being to learn your strokes. Learning which direction and what strokes make up each letter make more effective writing, and a neater finish. 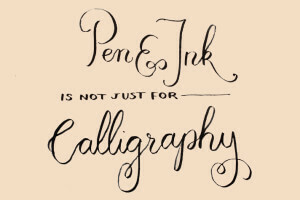 Each letter of the alphabet is not as straight forward to write when it comes to calligraphy pens and ink, so finding a book that shows you directions for each letter, or searching online would be a great asset. The second pointer I found was using a general rule: every down stroke has more pressure than the upstrokes. This creates the angled, thick-and-thin effect. 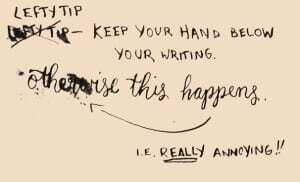 This rule of thumb is actually really helpful if remembered for every letter you write, and the finished result looks a lot more awesome. Something you would imagine to be pretty straight forward, wouldn’t you? But no. Sadly, I learnt this the hard way too. 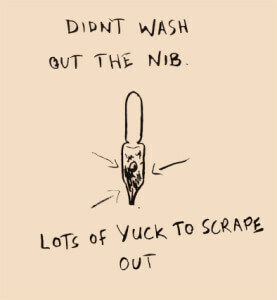 Be sure to clean your pen nibs and remember to wash out the ink reservoir so it doesn’t clog up the nib with dried ink. Another mistake I made was to rinse my pen in water, and dip it straight back into the ink. Though I can’t be certain how big of a no-no it is, I noticed a watery layer on top of my ink when I next went to dip, which made the flow a bit patchy. So whether or not I was wrong in doing so, I suggest playing it safe and keeping water out of your ink. Have a go at drawing! Or experiment what you can do with different kinds of ink, or even watercolour paints! The possibilities are endless. 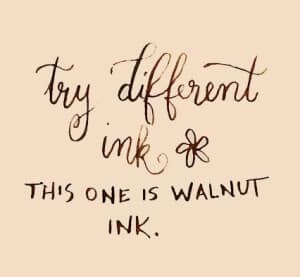 Remember that whilst there is still much to learn in the realm of calligraphy and ink, the most important thing is that you enjoy yourself and have fun with it. If it’s something you’re passionate about, try doing some research and study it further. 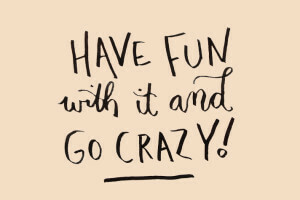 But if you just want to have a good old fashioned romp with writerly and arty stuff, do whatever you want! I’m sure you’ll learn a lot and have heaps of fun either way.